I became a windsurfer in the late 90’s. It was all I thought about and encompassed all aspects of my life. I thought and lived wind. In the late 90’s I spent many a cold winter nights watching instructional windsurf videos. My favorite videos were the productions of my now friend and colleague, Dasher. Dasher made these cool videos of some kids n Aruba’s sister island, Bonaire. They were crazy hot shots on Bic mini rigs. I had heard whispers of this island in the windsurf community but never made it there. One day in cold February 2001 my colleague and friend Tinho Dornella told me the team from Bonaire was coming to his event, Calema. I had been to Calema twice and thought there was no better way to see the team then to scout them out. I was the co founder and event coordinator of King of the Cape with my then colleague Marc Lefebvre and we wanted them at our event for June. We flew down early March and met the team. Tonky Frans has a face full of piercings and a killer smile. He had red hair too. It was electric. He later told me Andy Brandt tutored him to stand out and that’s how the red hair came to be. Me, I don’t think he needed the red hair. He stood out, that’s for sure. Little Kiri Thode stood on the shore shivering in the March air. Chris Bernabella was there as laughing with his friends. He told me he loved Florida but did not love the cold. I asked around who was in charge. I then met Byron Tromp. Byron and I spoke and agreed they would try to come to King of the Cape, a PWA sanctioned event. They worked hard at their end finding sponsorship through many sources including Air Jamaica. Back on Cape, Marc Lefebvre and Nevin Sayre (Fiberspar) connected and agreed to sponsor the team any way we could. Nevin and his wife Stina took in a crowd. I had a group at my house. The rest is their history. They dominated the event blowing away the pros in attendance. I recall Martin van Geehoven being astounded with Taty Fran’s flat water loop that sealed the deal for his win. Brian Talma was in attendance meeting little Kiri Thode who we called the “mini Irieman”. That was the start of a very special friendship; Kiri barely spoke English back then. The team went back to Bonaire but Ro Mayer and Tonky went on to the Gorge. Tonky dominated the Gorge Games and Ro was a force to be reckoned on the water. My daughter I traveled West to join them and witness windsurf history. Windwing saw something in the guys and sponsored them. Bill Morrisey from Dakine also took on the team as riders. Nevin hooked the guys up with Fiberspar gear and AHD boards. After Cape Cod, the Gorge was the second part of the world to catch a glimpse at their brilliance. This was just the beginning..it all exploded that year, 2001 but it started wayyyy before that. 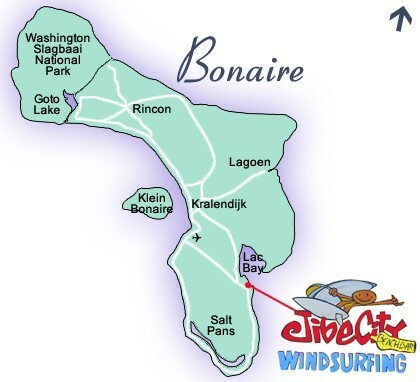 World reknowned producer Peter Robertson and his colleagues, Daphne Schmon and Robert McCormick are documenting Bonaire’s windsurf history.Take a glimpse at their story as shown in the trailor in “Children of the Wind”. This soon to be released production will warm your hearts, expose you to a culture and introduce you to young people who have a passion that breaks through all barriers. The weather contrast from yesterday to today is vastly different. An 11 AM squall during the heats created a wild frenzy on the course. Then, the wind was gone. The winds are well below the wind minimum for racing so heats were postponed. The riders are taking a break from two days of course racing working on email correspondence, listening to music, catching up on windsurf news and tuning gear. Many are taking to the sea to enjoy the Caribbean blue. In the Master’s Division Sergio Mehl A 21 is creeping up to the 3rd spot. Thomas Faust ITA 106 still earns top spot but Markus Poltenstein, AUT 30 knows it’s not over yet. In the Youth Division Enes Yilmazer TUR 2 is determined to hold the top spot in his division. He is a confident talent riding for JP Australia and North Sails. Sebastien Kordel GER 220 is focused on remaining in the top 3 positions. Malte Reuscher ITA 7777 is the most easily visible sailor with his black Point 7 sail. He is a worthy opponent to watch in future heats. In the Junior Division Luigi Romano is still on top despite a disqualification. Sail ITA 911 is riding for RRD and Simmer Sails. Gutek Kurzewski POL 75 was resting during todays no wind afternoon in preparation for future heats. He is confident and determined. Morane Demont from France is a driving force staying in the top 3 against her male opponents. Morane rides for Starboard and Severne Sails. Everyone is gearing up for the big night in Rincon tonight. At 5 PM the Paranda Party Bus leaves Sorobon for an island tour. At 7 the villagers of Rincon will host a night of music and culture at Magazina di Rei. Once the site of grain and food storage in the days of slavery, this is a historic building steeped in history. There will be traditional fire dancing, local food and music. Tue. night the freestyle under the stars was phenomenal. This a fun informal event spotlighting local talent. It was a brisk windy night. Judges Ro Mayer, Mac, Jaeger and Elvis coordinated single ladder 3 min heats to see who would be crowned King of the Night. Kiri Thode won the title King of the Night for planing freestyle while Caesar Finies won the title for non planing. There was a lovely chicken BBQ and local music. Windguru (www.windguru.cz) and our local weather forecaster (www.meteo.an) were right on with the weather forecast. The winds have been great for our windsurf tourists. The ABK Clinic attendees are certainly having a great time on the water. The next two weeks are easily two of the busiest weeks on island. If you can find some last minute airfare, call me at 800-219-0118. I have some killer last minute deals. It’s 4.5-5.5 wind all the way. 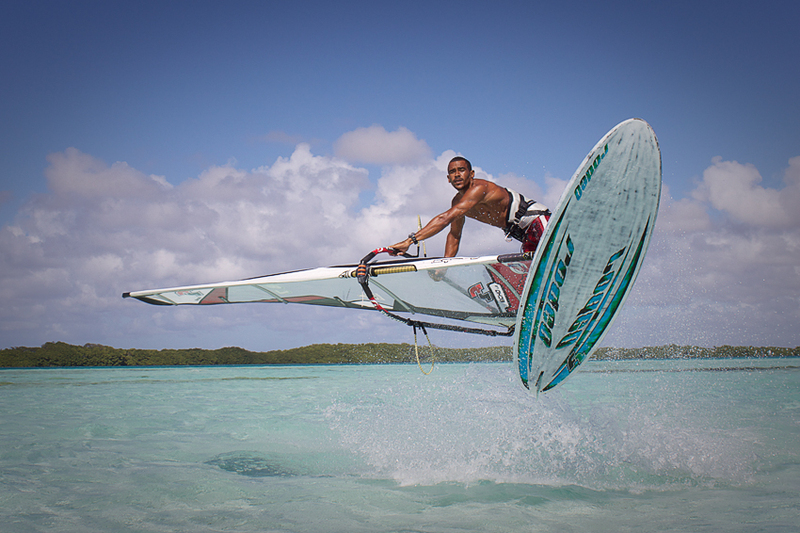 Enjoy a photo of our rock star Kiri Thode on the water! !